Hello, my name is Jacqueline Flett. 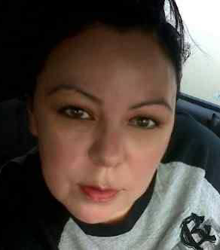 I am an Ojibwe woman from Peguis First nation reserve. I am a proud parent of three daughter and four grandchildren. I am currently finishing my four year degree in Bachelor of Science. I will be graduating with two majors – Psychology and Native Studies – in May 2014. I graduated from Peguis Central School in 1990 with my grade 12 diploma. I became a single parent with two children after graduation. Being a single parent came with struggles. However, I still had my goals in my mind to further my education. Four years later I was accepted in the prep course for Aboriginal students at the Red River College. After graduating from Herzing I enrolled in the Business Information Systems program at Herzing Career college, and graduated with a diploma. I moved back home to Peguis First Nation. I worked for the Peguis School board, as a receptionist, for nine years. I was sitting at my desk one day and did not find my job challenging anymore. I wanted a career, and I wanted to give my children a better life. So I filled out my application and was accepted to the Bachelor of Science program which started in September 2008. I always knew I would further my education after high school graduation. I was not one to give up on my future goals. My father and mother were great role models in my life as I was growing up. My father was a hardworking man who worked all his life, eventually owning a business. My mother was a single parent to six children. She received her Masters in Education at the Brandon University. I saw her overcome many struggles to get her education and also raise her children at the same time. She is my inspiration and I wanted to give my children what she gave me. I thought if she can overcome everything she has been through in her life, so can I. My plans after graduation are to further my studies and enroll at the Minot University for the Communications Disorder 2 year program. After Minot, my long term goal is to take my masters in audiology in another province, or become a speech and language pathologist and work on my reserve. My philosophy in life is to be grateful for all what you have in your life. Life can be a struggle at times, but if you remain positive, your path and journey in life can become clearer and easier to go through. Plan for your future and make some goals in life. It may take a while to reach your goals but never give up. I would like to nominate a student who really stands out for me – Jacqueline Flett. She is completing her degree in psychology this year. In simple terms, Jackie is a mother and grandmother but also a dedicated and focused student. She is working toward completing her own degree while providing support to her own children and grandchildren. She is a great representative of the many women who are finding a way to successfully manage many aspects of their lives. We are lucky to have her as a representative of our program and our institution.